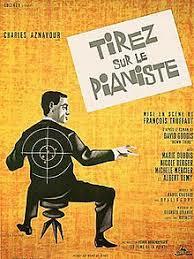 The original title for this film is Tirez sur le pianiste. As much as I enjoyed this I didn’t think it was as good as 400 Blows, 1959. There was no funding available from any of the studios, so Francois Truffaut and his crew shot the film on the fly on the streets of Paris, as they went along they often just made the script up. The ending was not planned but just decided on the basis of who was available at the time of shooting. When this film came out it was a huge hit with critics, but bombed at the box office. This is often considered a masterpiece of the film noir genre. According to the BBFC one or more versions of this work have been cut but the details are no longer available.